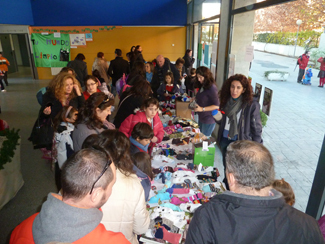 About 200 people attended yesterday Solidarity Market organized by the College Mirasur in Pinto (Madrid) which is able to acquire the puppets made ? ?from recycled textiles during the workshop 'Puppets of the Millennium. The workshop was sponsored by Humana on 30 November with the participation of 178 people, including children and their families. The proceeds from this market will go to Children`s Town project in Zambia. The objectives of the workshops' Puppet Millennials are to encourage creativity by making puppets with recycled materials, with special attention to the clothes, and learn to reflect on the small actions that citizens can do to contribute to sustainable development and the progress of disadvantaged communities.